What makes a really scary haunted house? My dorm and another are joining up to create a large haunted house for Halloween. The haunted houses for the past three years haven’t been very scary (according to the student body). Do you have any suggestions on how to create a truly scary haunted house? Edit – sudden darknesses, or unexpected noises could be cheaply achieved???? 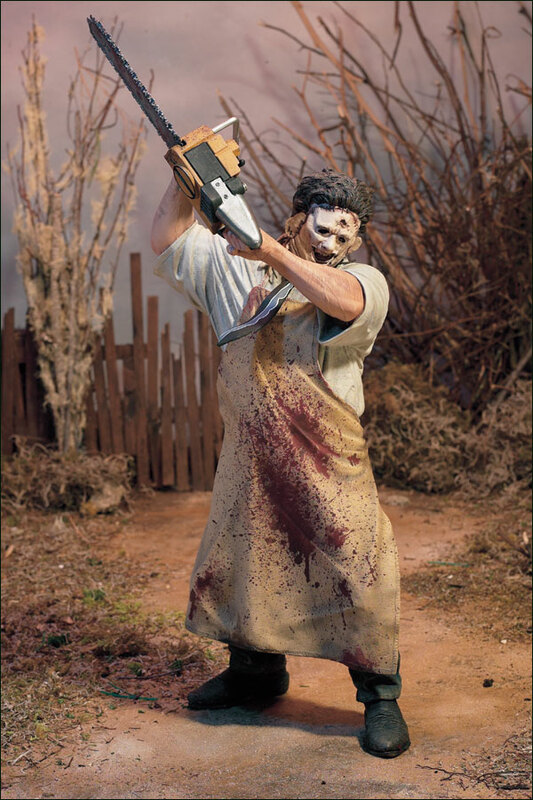 By far the scariest thing I’ve experienced in a haunted house was a huge guy made up to look like Leatherface from The Texas Chain Saw Massacre (1974). He had a live gas chainsaw. He would start the thing (once you were inside the house) and rev it, and jump out and touch people with it, revving the crap out of it as people scattered in sheer panic. It had the chain removed. It’s impossible to tell the difference in very low light. I just about crapped my pants as I tried to run through a wall. Make your victims… I mean, visitors feel uneasy, and like they aren’t in control. Make a dark hallway and hang dozens of threads at face level from the ceiling. Spray them with water before the house opens and have people in all black hiding in the dark at foot level who will touch the visitors’ feet with chopped up fun noodles. Make a fake hallway with black and white striped walls and paint a body suit the same pattern and color. Have someone wear the body suit and press up against the wall and jump out when people pass. Be sure and have a strobe light and a even a smoke machine in the hallway, perhaps. Play audio recordings of babies crying and people screaming. Be as unsettling and gross as possible. I’ve never found the actual costumes or anything to be genuinely scary, but not being able to see where I’m going when someone jumps out and screams at me is a good way to get me to leap out of my skin. I like the suggestions above, and will only add one thing. At one haunted house we visited years ago, there was a long line waiting to get in. As we stood in line, a couple of people in creepy and disturbing costumes were walking around. They’d come up to you and just stand right next to you, staring at you. At first you’d giggle, then start to get creeped out. They didn’t jump out and try to scare anyone or touch anyone. Just stand there. Silently. Staring. You could build a maze, have it be very dark with fog and scary sounds. Each time someone makes a wrong turn in the maze, have someone waiting to jump out and scare them, or just stand there moaning or talking gibberish and acting kind of insane. If possible, make some parts of the maze moveable, so you can separate people from their groups. Suddenly finding yourself alone in the dark would be very frightening! @MissAusten, I love the idea of a movable maze and someone just muttering gibberish at you. someone chasing you in particular with a chain saw. Tell people that someone got murdered in there in the past. And the murder was unsolved. @Carly Have the power cut off at a certain time. ooo, that’s a good one! thanks! Having people being chased by a scary movie villian like Michael Myers, Freddy, Candyman, etc with a rubber knife or ax. One time I went to a haunted house and at the end of it, a guy ran out and chased me for a few seconds. It was so scary especially because it caught me so off guard. Why do you love Halloween so damn much? It's time to have an honest, open discussion on what you're going to be for Halloween. Where can I buy a reptile or raiden costume from mortal kombat? What is everyone on Fluther dressing up as for Halloween?